Sunscreen SPF – Is It Just a Numbers Game? 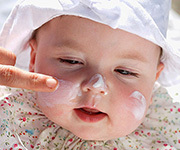 05 May 2013 Comments Off on Sunscreen SPF – Is It Just a Numbers Game? Paying More for More “Relief” While it is not a substantial raise in cost for SPF 30 versus SPF 110 (yes that’s right Neutrogena makes an SPF 110!) it is something to consider when you are buying natural sunscreen without harmful chemicals versus one with cancer causing ingredients. Many people feel it is hard to shell out extra bucks for a natural sunscreen such as Badger Balm when it only has SPF’s of 30 and 34, when they can pay the same price if not less, for an SPF of 70-110. Be rest assured that since you only need the recommended amount of 30 SPF in order to protect yourself from UVB rays, do yourself the favor and spend the extra bucks knowing that you are not causing other problems to your family’s health. Even though Water Babies offers an SPF of 70 (and market to, well, babies/children) their ingredients are too disturbing to even think about using. Their EWG.org/skindeep rating is at a 7. This is because there is a moderate hazard of cancer (how ironic), and high hazards of allergies, immunotoxicity, endocrine disruptions, as well as high hazards of developmental and reproductive toxicities. Not something I would put on my baby, child, a pregnant mother, or anyone else for that matter. Water Babies are not the only brand that receives a high rating from the EWG for their dangerous ingredients used. The long list includes Neutrogena, Coppertone, Banana Boat, amongst many others, several who claim to be ‘natural’ and ‘safe’.